The roof probably dates from the eighteenth century, with some reconstruction in the nineteenth century and structural supports being inserted through the years since. It possibly follows its original form, but there’s no certainty. The roof is covered in plain clay tiles, which is typical of Tewkesbury buildings. This has made for very unreliable water drainage arrangements, Gutters are formed from lead-lined timber channels which send all the water to downpipes at the rear. To do this, the gutters run through the roof space. The rainwater from the front of the building flows to the back along these channels, collecting water from the two ‘wells’ along the way. 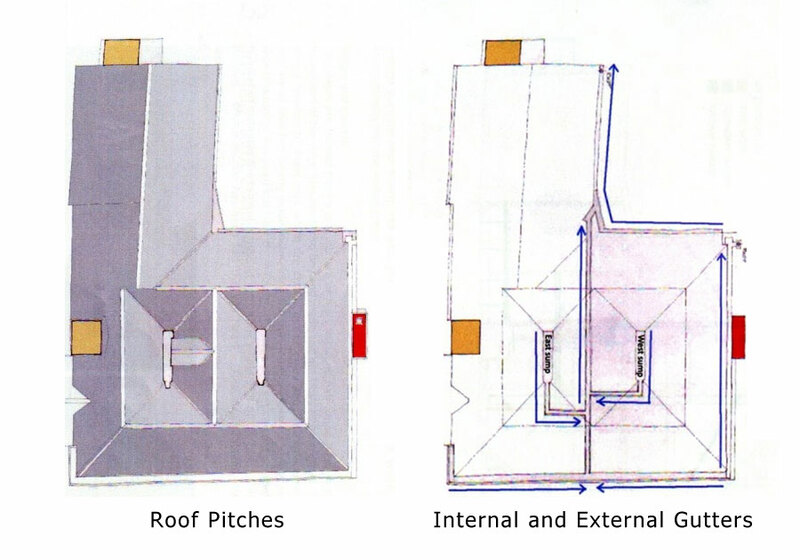 This arrangement has two drawbacks; blockages can flood the building, and have done; sealing the roofspace against draughts and wildlife is impossible, because the gutters have to pass through. Evidence of past problems can be seen in the second floor ceiling, where leaks over the years have caused the ceiling to sag badly. Downpours which exceed the capacity of the drains have caused this damage.